Shape of the World Review – Vibrant but Empty! Imagine spending the time to play a game multiple times only to find that after doing so, you’re utterly clueless about what you just played. Now imagine if someone were to ask you questions about that game. Questions pertaining to characters, the story or even the basic concept behind the game and your only answer is your complete and utter speculation behind the game. Shape of the World developed by Hollow Tree Games is the perfect example of a game that by the end will leave you more oblivious than knowledgeable. 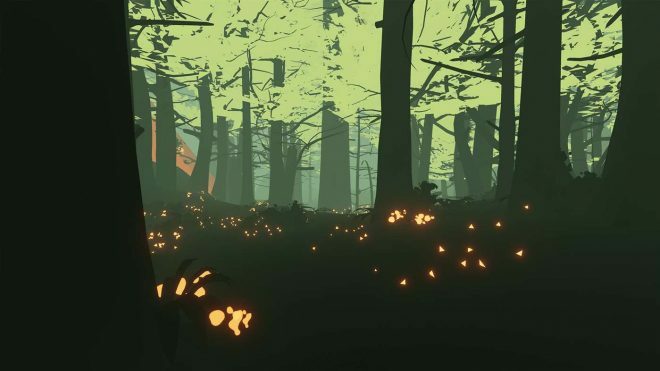 Shape of the World is a First-Person Exploration game that allows you to move around the world around you at your own pace. Players start in a strange valley clouded by fog or something else entirely that brings visibility to a minimum. Ahead in the distance is a Red triangle-shaped arrow. As you approach this arrow, the game will begin to teach you one of the two only mechanics of the game, interaction. By interacting with a set number of glowing monuments, a stairway will appear allowing the player to progress. As the player nears the arrow in the sky, a smaller triangle shape appears on ground level. Walking through this triangle-shaped gate takes the player to the next area. In the next area, we are introduced to seeds. After collecting seeds, Pressing the left trigger will allow you to plant a seed into the ground, which grows a tree. Pressing the right trigger while standing near the tree will spring you forward destroying the tree in the process. It’s at this point the exploration begins and the game quickly loses itself. Different forms of Travel – A large part of the game you’ll find the need to travel from one place to another. Walking is normally the default method of travel in any game, but it’s also the slowest. Throwing seeds to grow trees and interacting with the tree itself will allow the player to spring forward. 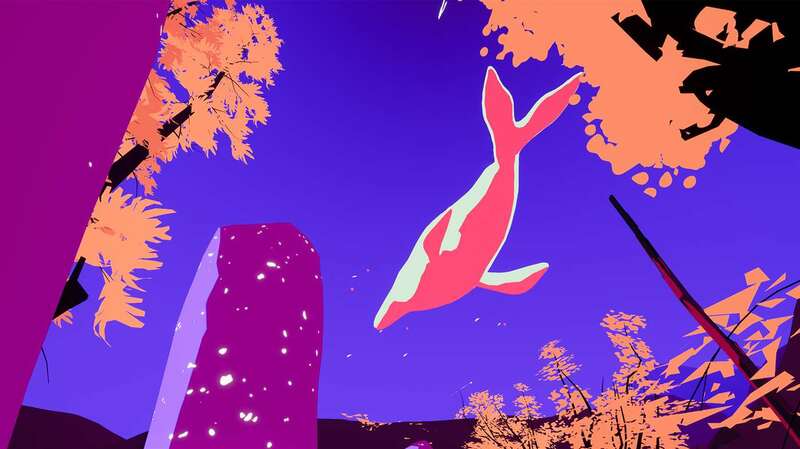 The player can interact with multiple trees while airborne to continually fly forward. Some areas offer a starry-sky style monument with a circle shaped hole. These monuments can be interacted with at a distance and slingshot the player into the air towards the monument. These are the fastest way of travel but only work when standing at a distance. Fortunately, the levels they appear in normally have an abundance of them available in the same area. Swimming is also a valid point of travel in certain levels. 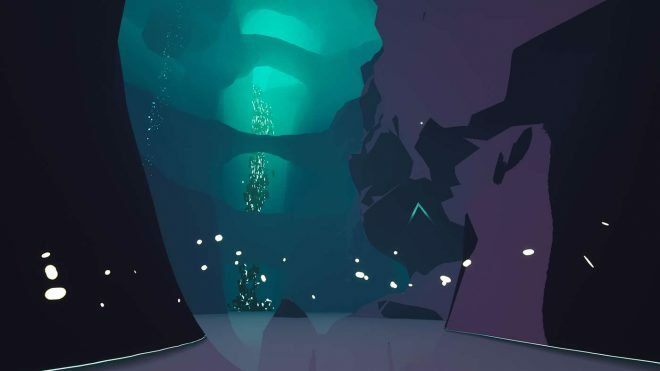 There are crevices and donut shaped rocks underwater that can be interacted with which will cause the player to swim rapidly in the direction they are facing. Color Trip – Almost everything you do in Shape of the World will change the color of the world around you. Walking through the triangle-shaped doorways, collecting seeds and even transitioning to new areas will cause the colors of the world around you to change. It’s quite vibrant and artistic. Some colors work better than others due to the darkness of the sky and plants. Other colors can be off-putting or distracting as they make visibility a bit more difficult. Even some of the less open areas of the game such as caves or mountains still take advantage of the color transitions in a way that works. Interactive Soundtrack – Probably one of the more interesting concepts of the game comes from the interactive soundtrack. This really would be the only way of knowing if anything was getting accomplished due to the variety of different beeps and boops that happen when interacting with monuments and discovering seeds. Even at the point that the triangle-shaped doorway comes into view, there is an audio cue to let you know, just in case you aren’t looking in its immediate direction. Absent Plot – Unfortunately, there is no character presence in the game so there is nobody to get to know. There’s no story behind the world you’re exploring. There isn’t even any type of plot to explain what you’re doing in the various areas, or what exactly is being accomplished. Everything about the game is left to the player’s imagination. That’s not to say that using your imagination is a bad thing. The problem is that nothing about the game is explained. What are these monuments you’re activating? What differences does one seed have to another other than appearance? The only noticeable idea behind the game comes from the level select. On the level select screen is the triangle shape. On the very bottom is the first level, and each additional level goes up. This could mean the game is all about ascending. It’s pure speculation. Other than that, prepare to be lost. Play Time – Obviously, depending on how much you explore and all you do, play time will be different from person to person. A look at the game’s achievements will show they ask you to complete the game three times. The first playthrough took around 37 minutes. During this time there was complete confusion on whether anything was actually being accomplished. The second playthrough was experienced a bit more slowly and finished at around an hour and a half. Of the 28 total seeds in the game, 16 were found during the first playthrough, and 7 more were found during the second playthrough. Other than the few more seeds collected there wasn’t much difference from the first playthrough. On the third and final playthrough, the game was completed around 2 hours. One more seed was collected for a total of 24 out of 28. Though, even with heavy exploration, there was little to no difference from the first playthrough. The game is all about exploration, but the world doesn’t present much of anything to make exploring the different areas purposeful. Overall Objective – For a game based solely on exploration, you’ll quickly come to realize how little there is to each world. Granted there are interesting creatures you can potentially interact with. Some will even flee the moment they lay eyes on your approach. But other than these creatures and the seeds you can collect, there really isn’t anything to really do other than the main objective to progress forward. Walk through a gate, activate the pillars that spawn, climb the staircase that appears leading you either to the next gate or to the end of the area. Rinse and repeat. 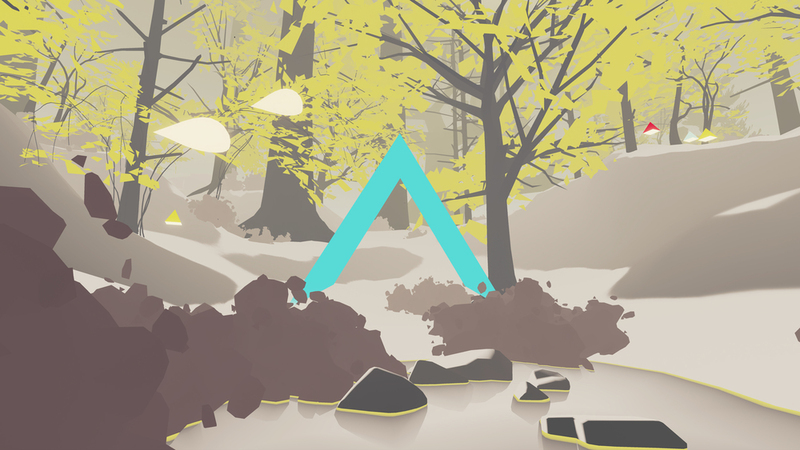 For a First-Person Exploration game, Shape of the World falls flat. Once you realize how little there is to explore, it defeats the true purpose of the game. It’s at that point that the game becomes an interactive walking sim. Completing a game three times with little to no difference between playthroughs even despite the substantial difference in time played begs if the game is truly worth it. The $14.99 asking price seems to be asking a lot based on how little content the game has to offer. That’s not saying you should avoid the game entirely. The game is worth at least one playthrough to experience the beauty and vibrancy of the colorful, relaxing world. Though without plot or characters, many will find themselves to be disinterested. Shape of the World was developed by Hollow Tree Games and published by Plug In Digital. 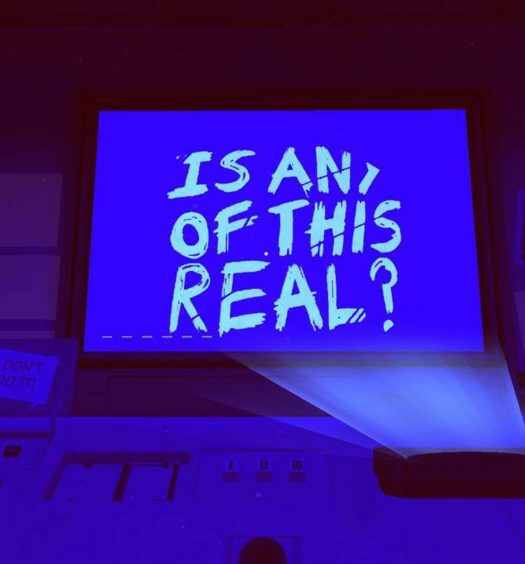 The game released on June 6, 2018, for $14.99. A copy was provided for review purposes.